Advocacy and self-determination are an important part of life for people with disabilities. They are crucial skills to learn and practice to ensure that a person gets the right support. For some, advocacy is a learning process. For others, it’s just part of who they are. Chelsea is one of those people who has always been a driving force in her own life. Now she wants to pave the way for others, too. “I don’t like to be thought of as a Blind person, but as a person who just happens to not be able to see,” Chelsea said. “I want to be known for who I am and what I do.” Chelsea credits her family and teachers for her shaping her attitude and sense of independence. She said she was taught to be as independent as possible from a very young age, and not let anything get in her way. Chelsea has a visual impairment, but when describing her, that aspect wouldn’t even make the top 10. Chelsea is an independent, young woman who leads a busy life. She lives on her own and enjoys spending time with her boyfriend, Mike. The pair enjoy many shared interests, including Magic: the Gathering, and Dungeons and Dragons. Both are intricate games with cards that require a lot of creativity and social and mental skills. The games are also very visual. The detailed cards depict unique characters with a listing of their strengths and instructions. While it would seem at first that this game doesn’t lend itself well to a person with has a visual impairment, it’s no barrier for her. Chelsea developed braille sleeves for her cards, helping her identify them and read their characteristics. As a surprise, her boyfriend also created a braille 20-sided die to assist her during play with her group. Chelsea is also involved in Martial arts. 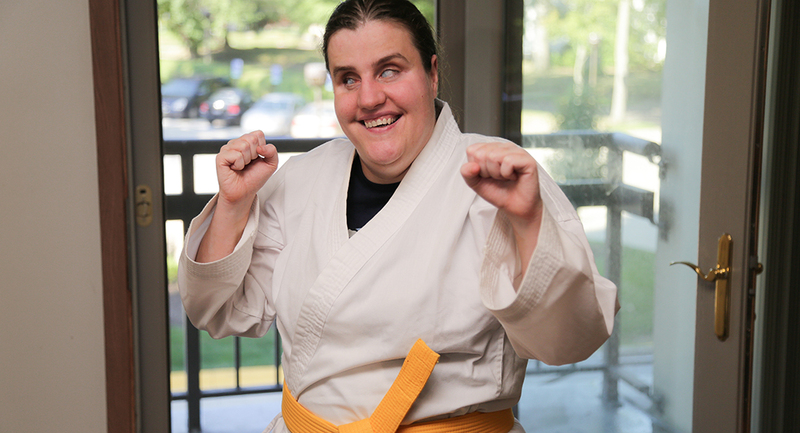 Again, it would appear that martial arts would be a barrier to someone with a visual impairment, but not for Chelsea. “I love it!” she shared enthusiastically about her classes. “They were nervous though. They had never worked with a Blind person before. But Matt took to it like a fish to water!” she said of her instructor at Zahand’s Martial Arts. Now, Chelsea is just like any other student in her class. As if all those things weren’t enough, one of Chelsea’s most recent accomplishments is her braille certification from the National Federation of the Blind. She spent the last few years working toward her braille certification. After earning her certificate, Chelsea can now help others. “From the first day I met you, you wanted to make books and other things available to everyone,” said Summit DD Service Coordinator Alison Taylor to Chelsea. “She is very passionate about brailing and wants to make it her career,” she continued. Chelsea went on to talk about the many types of materials that she would like to make accessible. “[The certificate would] allow me to provide braille services to Blind people or people with Blind clients. I could transcribe product manuals, schoolbooks, event programs, songbooks for churches, anything really,” she explained. She is even “hoping to leverage Magic [the Gathering] into a business,” referencing her adapted card sleeves and braille dice. Chelsea has dreamed of this day for a while. She even has her business name picked out, Read the World: Braille Transcription. 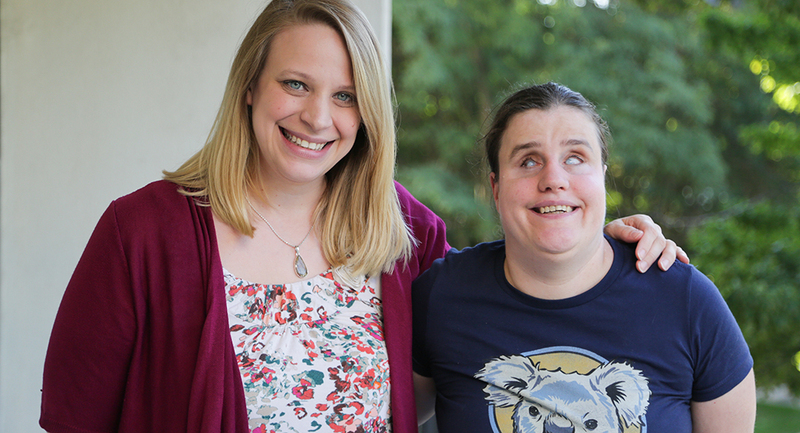 With the name picked out and her braille certification, Chelsea is now working with Alison to access funding for the equipment and software she will need. 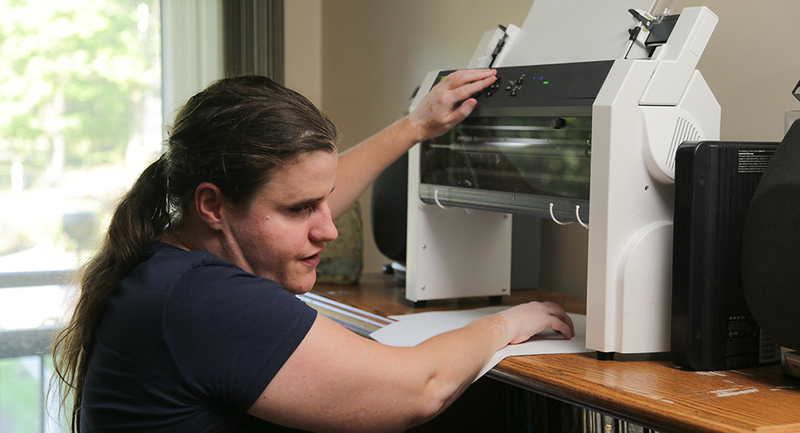 To meet her clients’ needs, she will need things such as a specialized printer with specific accessories, transcription software programs, braille paper for the printer and a new computer. She’s also identified training courses that she will need to help put her employment plan together and market her business. Chelsea is committed to her dream of knocking down barriers. Her ambition and drive have set her on a path of independence – not just for herself, but for others – which is exactly what Chelsea set out to do from the beginning. Check out more inspiring stories on our blog. You can also check out additional videos of Chelsea in karate.